Yawn! You may not be getting your 40 winks, and you certainly may need a nap; but keeping up with what to expect for your baby's sleep and schedule can be exhausting too. How much sleep does my baby need? How many daytime naps are normal? When will the baby (and I) get to sleep through the night? When can we get to a consistent sleep schedule? These questions, and your individual baby sleep realities, are what keep many moms up at night. 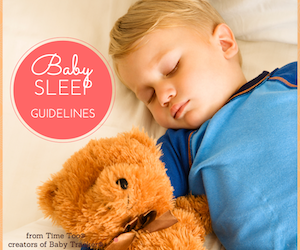 We wanted to help you find some answers, and give you access to some of today's guidelines, tips and know-how about baby sleep schedules. In February 2015, the National Sleep Foundation, the well-respected sleep research and health education organization in Wash DC, published its new expert recommendations for total daily sleep for infants and children, by age group. Their new sleep recommendation charts also identify some baby sleep variability at both ends of the recommended ranges, and tells you when you might want to check in with your doctor regarding too much or too little sleep. Alright, so you now have some idea of total sleep, but you’ll want to remember that babies have different sleep cycles than adults. And sleep, especially in newborns, often looks restless, and comes in short sessions and bursts. So it sometimes doesn't feel like 14-17 hours of what you might call sleep. And its not too great for planning around a consistent sleep schedule, or getting any sleep yourself. So what about night sleep versus day sleep -----and can you expect and plan for. One of our favorite charts is a compiled Pinterest post using information from two books on children's sleep. 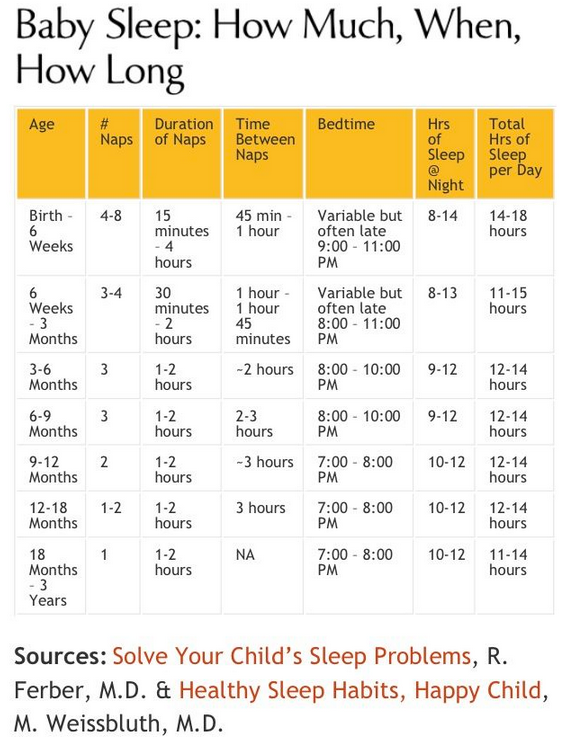 What we love about this chart is it calls out sleep patterns and durations for daytime scheduling, as well as gives some guidelines for a baby’s bedtime and hours of nighttime sleep. 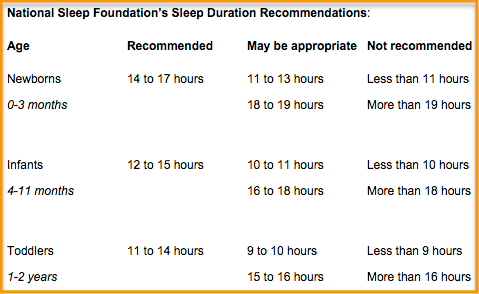 *The total sleep guidelines align with those offered by the National Sleep Foundation (chart above), with the exception of the 6 week - 3 month mark which we can't quite reconcile. What is important to note is that during the first weeks, most of a baby's sleep centers around feeding sessions every 2.5 to 4 hours---and can be unpredictable. At about 3 months, and/or 12 – 13 pounds, most babies can extend their nighttime sleep to include one longer 6-8 hour sleep session which may be surrounded by a 2-3 hour lead-in bedtime sleep session, or followed by early am nighttime finale. During the day, older infants shift to shorter, less frequent naps (2-3) for the first year. Establishing a sleep routine after they begin to get into a more consistent schedule, and putting baby down when drowsy versus asleep are two tips we see time and time again. A consistent routine and schedule for bedtime, nighttime feedings and naps is important to help baby learn how to soothe and put themselves back to sleep. The other tip we hear is to try to distinguish day sleep from night sleep. At night, keep it quiet and dark (use nightlight) ---it is not the time to stimulate the baby. Feed, burp, change, soothe, swaddle ----and then lay back down to sleep. Attempt to soothe in crib first before picking up or rocking back to sleep. As for the day, “daytime is playtime” --keep it light and this is great time to connect, talk, sing, cuddle and make baby feel secure. Also don't be fearful of a little noise during the day, get baby used to the sounds of the day. And lay the baby down at consistent nap times when possible. - Place baby to sleep on his/her back with face and head clear of blankets and other soft items. - Encourage baby to "self-soothe" for sleep. And of course, know that tracking sleep sessions and schedules, you can “count on us” and our Baby Tracker line of schedule and activity tracking journals. We have journals to monitor and track the daily feeding, sleeping, diapers, play, todo’s and milestones of newborns, infants and toddlers. There are plenty of other sleep tips, and a great article on infant sleep from Lucile Packard Foundation at Stanford Hospital. You can read more here. Hope this helps. Wishing you joy-filled days and sleep-filled nights. Cited Sources: Lucile Packard Children's Hospital at Stanford University; National Sleep Foundation; "Solve Your Kids Sleep Problems" R. Farber MD and "Healthy Sleep Habits, Healthy Child" M.Weissbluth MD.via Pinterest post. All content and sources referenced in this article and on this website, including health-related information from medical and non-medical sources, are guidelines, opinions and for informational purposes only and should not be considered to be a health treatment plan for any individual situation. Always seek the direct advice and diagnosis of your own pediatrician in connection with any questions or issues you may have regarding the health of your baby. Looking for for a time-saving product or service, or some helpful tips and resources? Let us know and we will send out our Time Too journalists, research curators, mom writers and parent scouts to see if we can help. ﻿﻿Baby Tracker® and Time Too® are registered trademarks of Time Too LLC.